I was pleased to lead a delegation of dedicated volunteers on the Save Our Surgrey Committee to meet with David Walsh, Head of the HSE, in Kildare. 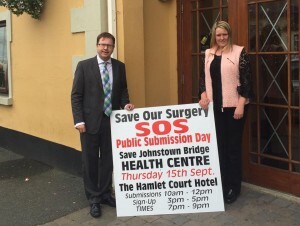 In our meeting we discussed the recuirtment process for Johnstownbridge Health Centre, clearly outlined the demand for the centre remaining open, and got reassurances it would remain open once a new full time GP has been hired, and any new GP who be provided with the Rural General Practitioners Allowance. One of the main reassurances we were told by David Walsh was that the rural practitioners allowance would be kept with the surgrey. This is a huge improvement in the job offer as this was not confirmed before the committee began to apply our pressasure. This will make the position significantly more attractive to prospective applicants to take over the practice. Chairing the first public meeting on the future of the Health Care Centre in Johnstownbridge. The HSE have committed to us that the centre will be preserved long term and supported including support staff as necessary. This will inculde renovations to the existing building and additional staff as the practise grows even further. Over one thousand signatures and hundreds of testimonials were gathered by the committee and handed over to the HSE. 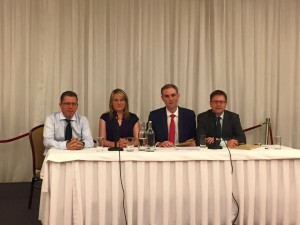 If these alone do not show the need for a full time GP in Johnstownbridge the committee members inside, and outside the meeting, certainly did.